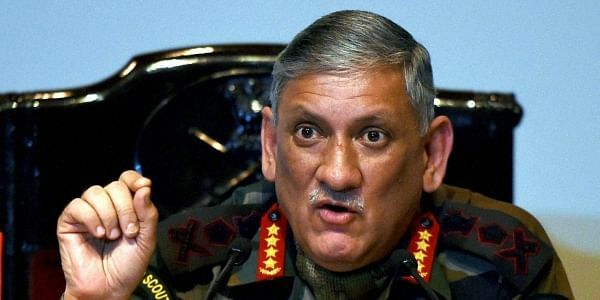 The army chief said that of late, politicisation of the military has been taking place when it shouldn't be happening. “I think we operate in a very secular environment. We have a very vibrant democracy where the military should stay far away from the polity… Whenever there is an issue of linking any military establishment or military personnel where political entity comes in then... that is best avoided," he added. "Defence forces in India will do well if they remain above (politics). Where they are expected to remain, and do not meddle with political affairs of the nation." he said, declining to elaborate. "In the good old days, the norm was that women and politics were never discussed in the forces. However, these subjects are gradually inching their way into the discourse and this should be avoided." When asked about the Army being asked to build foot overbridges after the stampede at Mumbai's Elphinstone railway station in October, Rawat noted that there is a charter of aid to civilians under which the armed forces help out in times of crises like floods and earthquakes. "Perhaps it is not so much to do with the army staying out of politics as much as a veiled warning to politicians to stop using the army," said another officer who requested anonymity. On the flip side, the armed forces are not immune to political interference. General Kodandera Subayya Thimayya, the sixth Indian Army, quit in 1959 over a dispute with defence minister VK Krishna Menon, but was persuaded by Prime Minister Jawaharlal Nehru to stay on. Lt General Brij Mohan Kaul, who was appointed Chief of General Staff (CoGS) purely due to his his proximity to Nehru, is blamed for the Indian rout in the 1962 Sino- Indian War. And more recently, Admiral Vishnu Bhagwat, Chief of Naval Staff, was sacked by then defence minister George Fernandes in December 1998 for daring to question the appointment of his deputy. And then, of course, there was the rather unseemly public row over former chief VK Singh, now Minister of State for External Affairs, over his date of birth.